There is so much misinformation floating on the Internet about antennas in general, and mobile antennas specifically, it is not surprising many newcomers are confused. And for some, it is easier to believe myth, than a factual explanation. If you're not one of them, and you want to have a better understanding of antennas, particularly HF mobile antennas, then the real key is to learn the theory behind them. The best way to do this is buy yourself an ARRL Handbook and start reading. Although some of the information presented here is in other articles on this web site, it is best to set them out here in an effort to correct some of the more popular myths. While some of them can be applied to base station antennas as well, the thrust here is aimed at HF mobile antennas. Some of the terms used in this article are the same as those explained in the Antenna Efficiency article which should be read first. Readers should also acquaint themselves with with the different types of grounds. And remember, myths die hard! Advertising hype to the contrary, it is difficult to design a remotely-tuned antenna to cover 80 through 10, much less adding 160 and 6 meters to the mix! There are many reasons why this is so, but not the least is overall physical length. A full-length 1/4 wave, unloaded antenna for 6 meters will be about 54 inches long, and may be only 48 to 50 inches if the mast is large like those of most remotely-tuned antennas. This is slightly longer than the base/coil assembly of most screwdriver antennas. On 10 meters, a full-length 1/4 wave, unloaded antenna is about 96 inches long, but again may be somewhat shorter due to the mast size. Depending on the antenna brand in question, covering 10 and 12 meters will likely require installing a shorter whip. When it doesn't, it means the overall losses are higher than they should be. Any 160 meter mobile antenna will have very poor efficiency, perhaps as low as .3%. A really good one perhaps 1%. Part of the issue is the requisite inductance of the coil. Even an antenna 13 feet in overall (electrical) length will require an inductor in the neighborhood of 600 uH. Using the very best of construction techniques, maintaining a Q of even 100 is difficult. As a result, the coil losses are great enough, that impedance matching isn't necessary in most cases. When it is, the amount of reactance required will be vastly different than that required for an 80 through 10 meter antennas. Thus, claiming full coverage from 160 through 6 meters, even if it requires changing the whip length on the higher bands, is meant to sell antennas. It should also be noted that a 160 through 10 meter antenna, will be slightly less efficient overall than an 80 through 10 meter model. If you just have to have 160 meter coverage, think about an add-on coil, like the Scorpion unit shown at right. One very common comparison is the dB difference between one HF antenna, and another. As in; Oh, it's just 3 dB, or half an S unit, big deal! It may sound like no big deal, but it can be! What's lost in the translation is the effect 3 dB can have on the signal to noise ratio (SNR) on either end of the contact. In fact, sometimes, just 1 dB is enough that no copy, can turn into perfect copy. The real issue at hand, however, is just how much effort you want to put into your mobile installation. Further, depending on one's speech pattern, increasing the peak power output of a SSB transmission by 3 dB, can result in an increase of the dynamic range by 6 dB. This is the main reason amplified signals sound louder than the change in an S meter reading would otherwise indicate. No doubt, the single, most used reference (past the point of triteness) is the number of DX stations said antenna installation garnered. How or why this practice got started is an unsolvable mystery. As condescending as it may sound, amateurs who use their DX contacts as a reference, typically have the poorest of installations, and the worst of operating skills. 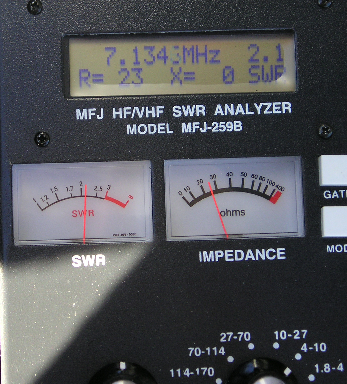 Why the number of DX stations worked has no correlation to any antenna parameter is simply this: Under the right band conditions (good propagation and low background noise level), it is possible to make on-air contacts, even DX ones, with as little a one milliwatt (1/1,000) of Effective Radiated Power (ERP). It shouldn't come as a surprise then, that on-air contacts can be made with 500 milliwatts (1/2 watt) of ERP. In fact, this is about the ERP of an average spirally-wound and/or short, stubby HF mobile antenna on 80 meters (with 100 watts input). Compare this with a decent quality screwdriver antenna, properly, and solidly, mounted where the ERP is about 5 watts on 80 meters. The difference is a little more than one S unit (assuming you have an accurate S meter). Therefore, some argue that a lowly hamstick or short, stubby screwdriver is an adequate HF mobile antenna. But is it? Well, that depends on too many (usually overlooked) factors. As alluded to above, one of those factors is the Signal + Noise/Noise ratio (SNR) generated in the receiver's front end. Most modern HF mobile transceivers will provide a 10 dB SNR with a signal as little as .15 microvolts (uV) above the band noise figure. As long as you can generate that level on both ends of the contact, you're home free. Since we also have to deal with background noise level on whatever band we're using, in the real world, it might take 10 times that signal level (1.5 uV) above the noise floor, and sometimes a great deal more! So, here's the question you need to ask yourself; Will increasing my ERP by just 10 dB really be worth the effort? Perhaps an even more important question is; Will increasing my S+N/N ratio (SNR) by 10 dB worth the effort? The answers to both? Absolutely! There is a antithesis in the second question. That is, the better the SNR, the less perceived the noise portion is. This is true whether it be man or nature made. This fact alone should give you enough food for thought to make a proper antenna selection. One of the most popular ancillary mobile devices is the automatic screwdriver controller. They're great safety devices too, because no intervention is required by the operator, save for pushing a button. Most of them work well as long as the RF imposed on the motor leads is properly choked. While it is true that some controllers will still function with a minimal choke, there is a hidden facet almost everyone misses. 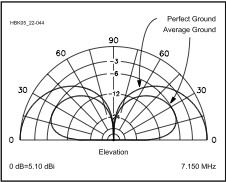 The perceived noise level we all contend with, comes from both man made noises (RFI), and nature (background static). The consensus of opinion is that all of this noise reaches the receiver via the antenna. Pundits confirm their opinion by disconnecting the coax cable at the radio or the antenna. If you've read the Common Mode article, you already know that the coax cable can be a major contributor. If you disconnect the coax at either end, there is no longer any common mode, hence the RFI disappears! The same is true for the motor control lines if they're improperly choked. Think of it this way. Every inch of coax and/or motor leads before the choke, are part of the antenna, and will both radiate and receive! Here's some more food for thought. Due to a preponderance of digital electronics, the insides (passenger area) of a modern vehicle is almost as RF noisy as it is under the hood! As a result, our inadequately choked control cable and coax are picking up the harmonically-rich, digital noise. This significantly reduces the SNR, and our ability to hear, even if they're not (directly) in the receive bandpass. The bottom line is, if you can't hear them, you sure can't work them! Lastly, it pays to remember that every mobile installation will have some level of common mode, due in part to the excess ground losses we all deal with. There are no viable methodologies to achieve positive gain with an HF (160 through 10 meters) mobile antenna, even when using a phased array (more on this below). That fact doesn't stop some manufacturers from claiming otherwise. There are at least two manufacturers here in the U.S. making spirally-wound, 6 foot long HF antennas, claiming they have gain because they are a 5/8 wave length. They may indeed have wire that long wound around their fiberglass core, but that doesn't make them a 5/8 wave gain antenna. In fact, if you could wind 100 feet of wire around a 4 foot long fiberglass mast, the electrical length would still be four feet. When you see claims like these, go elsewhere. Some misinformed amateurs argue that using two HF mobile antennas in a V configuration eliminates the inherent ground losses every mobile has. It does, but the resistive losses in the second antenna are just as lossy! Basically the same issue arises when using a two element, 1/4 wave phased array. While theoretically you can achieve a 3 dB increase over a single antenna, it doesn't address the overall resistive losses. There is even a seven-lander who claims his two element, phased array has 14.2 dB of gain. Compared to a dummy load one assumes! Far too many amateurs purchase VHF antennas based solely on their advertised gain. Adding insult, the published gain figure typically doesn't have a quantifying designator. That is to say, they just list the dB, and not the dBi or dBd (the i stands for isotropic, and the d for dipole). Without one of these designators, the figure is meaningless. And be advised, that a +3 dB increase in ERP (effective radiated power) will not magically double the distance you can communicate over, especially when using FM (actually phase modulation in most cases). In the real world, it may take as much as 10 dB, and perhaps a good deal more, depending on several factors (typically uncontrollable such as Fresnel zoning). Keep in mind, that antennas don't achieve gain in the usual sense. If you feed an antenna with 50 watts, the radiated power is still 50 watts. What does happen is the radiation pattern is changed. This results in more power being radiated in a specific direction, and reduced in others. It is this differential which is expressed as gain. Further, there is a good case to be made about using unity gain (Ø dBd) antennas in a metropolitan area. The reason? The HAAT (height above average terrain) of the repeater, versus that of a mobile, requires radiating power at higher angles. As a result, 1/4 wave, unity gain antennas perform better in these situations, than their higher-gain counterparts do. This article by Danny Richardson, K6MHE, compares the differences between 1/4, 1/2, and 5/8 wave VHF mobile antennas, and their effect on radiation patterns. While reading the article, note the saw-tooth like gaps in the radiation patterns. There are other factors to consider as well. Almost everyone mounts their VHF antenna via a lip or clip mount. The tiny coax supplied with these types of mounts, actually has more loss than the antennas mounted on them have in gain! Worse, the phasing coils used are minuscule, and any real gain they might exhibit, is lost as heat! Lastly, sturdiness is an often over-looked buying factor. Some Pacific Rim antennas are so poorly designed and made, that one good slap from a errant tree limb will render them useless. The theory of reciprocity as applied to antennas, states that the transmitting and receiving antenna beam patterns are identical. In other words, any gain (or lack of it) they exhibit applies equally to transmit and receive. However, in the real world, the performance between transmit and receive is not reciprocal. This is due to a variety of reasons, not the least of which is takeoff angle. Further, improperly installed HF mobile antennas may have their radiation pattern overly distorted, which exacerbates the performance difference. There are many more variables like SNR, and ERP mentioned above. To them we add atmospheric noise, propagation phenomena, and even ground losses, to name a few. In fact, the difference between transmit and receive performance can be rather extreme; sometimes you can hear better than you can be heard, and sometimes the reverse is true. So when you make a pat statement like, I can work any station I can hear, you're kidding yourself. However, if the statement is factual, you need a better antenna and/or mounting scheme! Designing mobile loading coils (they're really inductors) requires both science, and a goodly dose of practicality. It is also a discipline where bigger isn't always better! Here are a few salient points to keep in mind. As coils get larger in diameter, there is more distributed capacitance, and more resistive wire losses, both of which reduce Q. Thus larger coils have a lower self-resonant point. Above the self-resonant point, a coil acts more like a lossy capacitor, than a coil. Further, anything placed within the coils electrical field will lower the Q. Large metal end caps are an example. And, the size of the wire, the plating on the wire if any, the number of turns per inch (tpi), and the coil support structure (coil form), all have an effect on the (assembled) Q. Lower frequencies require more inductance in the coil, upper frequencies less inductance. The position of the coil within the antenna's overall length is also a variable, and the optimal position is partially reliant on ground losses. The diameter to length (D/L) ratio increases as the coil's reactance increases. Thus for optimal Q, monoband coils for the lower bands have ratios nearer to 1:5. For the upper bands, the ratio is close to 1:1. This also relates to a maximum overall length of about 15 inches on the lower bands. While monoband coils are still available, the remotely controlled (screwdriver) antenna has almost supplanted them entirely. Assuming we're using an 80 through 10 meter screwdriver antenna, and you jump through all of the optimal Q mathematical hoops, this is what you'll discover. The coil diameter will be ≈3 inches, wound with #10 silver-plated wire, at 6 tpi, wound on a form with a dielectric constant no higher than 3, and mounted about the half way point or slightly below. The overall length of the coil will hover around 15 to 18 inches, and look just like the one in the photo. Incidentally, the Scorpion 680, and the old Predator use nearly identical coil designs. Digressing for a moment. It is possible to build a monoband coil with a static Q as high as 450 or so, albeit rather difficult. Once the coil is mounted on the mast, and the top radiator (whip) is installed, the Q will drop. In the aforementioned case, the assembled Q hovers around 250, but may vary due to installation variables (ground loss, shunt capacitance, etc.). The reason most antenna manufactures don't publish their Q ratings is simply because they're really low—in the 50 to 60 range! Instead, they publish bandwidths which in reality have nothing to do with coil Q. Those that do publish Q figures, often quote the coil's static Q. Once large metal end caps and/or shorting bars are installed, the Q drops drastically! In one well known case, from a static Q of 450, to an installed Q of less than 100! True screwdriver designs suffer less in this respect, unless their coil design is less than optimal as described above. So how do you know what the assembled coil Q of your antenna really is? You don't! Measuring coil Q once the coil is installed within the antenna, cannot be done. It can be inferred, if you have the test equipment, albeit with poor accuracy. And, A vs. B field measurements are of little value. As pointed out above, designing mobile loading coils requires both science, and a goodly dose of practicality. Unfortunately, some Internet, pseudo-scientists lack reality when it comes to loading coils. They incorrectly believe that a loading coil replaces a certain number of electrical degrees. That assumption is false! The truth is, an antenna loading coil has an inductive reactance value, which cancels the capacitive reactance value, that a shorter than quarter-wave antenna exhibits. A lumped constant in other words. Thus at resonance, the resistive value of both the inductive reactance and the capacitive reactance will be equal, but opposite in sign. Further, the RF current at both ends of a loading coil will be equal. Pundits of the coil length myth argue that it is not, and use this false assumption as proof of their theorem. They're wrong! High-frequency mobile antennas are not perfect performers, regardless of their owner's DX claims. For example, if you were to mount a 1/4 wave, 10 meter resonant antenna (8.2 feet long), made of solid silver rod, in the middle of the roof of an average vehicle, the efficiency would barely meet 90%. In the real world, it is more like 80%. In other words, 100 watts might go in, but only 80 watts are radiated. As the frequency is lowered, the efficiency drops, and rather drastically. Fact is, the average commercially-manufactured, HF mobile antenna is about 1% efficient on 80 meters. That's not a misprint; 100 watts in, only 1 watt out, and you only get that if you mount it correctly! Sure puts new meaning into QRP operation! Short, stubby antennas, are much worse, as are thin, spirally wound ones. It is not uncommon for the efficiency level for these antennas to drop below .3% (that's point three percent!) on 80 meters, and well below this figure on 160 meters. Mount one of these antennas on a clip or clamp mount, and you can easily halve the figure; .15%. Length matters, as does adequate coil Q, and mounting height. Do everything right, and 80 meter efficiency can be ≈6%. Don't kid yourself, this isn't as easy as it sounds. It takes length (>12 feet), a high Q coil (300+), no doubt a cap hat, and a high mounting location with lots of metal mass under it. One thing is for sure, it is difficult to explain (and justify) these requirements when the DX myth is used as a yardstick. Usually, the maximum power any given mobile antenna can handle is based solely on the Q of its coil. Depending on that Q, at some given power level, the I2R losses will exceed the dissipation loss capabilities of the coil, and the coil will fail. If the dielectric strength of the coil form or its supporting structure is exceeded, an arc can form which can also cause the coil to fail. Contamination from road debris, water, snow, and especially salt residue, exacerbate the problem. As pointed out in the Antenna article, there are several screwdriver antennas rated at 200 watts PEP (or less!). Although they get warm during normal operation due to the rather high resistive coil losses (low Q), typically there's no permanent damage done. However, driving one with much more than 25 watts during the tuning process can result in damaging the coil assembly beyond repair! As above, the scenario is exacerbated by proper mounting (reduction of ground losses). Remember too, resistive ground losses are in series with the other resistive antenna losses (conductor, coil Q, and radiation resistance). As the power is increased, the ground losses also increase. Remember the formula for power loss is I2R. What this says is, the more ground loss there is, the higher the transmit power can be before excessive power losses damage or destroy any given (power rated) antenna. In any case, reducing ground losses is the holy grail of mobile operation as alluded to below! Amateurs typically purchase an antenna with a power rating perhaps twice their transceiver's capability. That's a step in the right direction, but the truth is, there will still be I2R losses turning transmit power into heat. Thus it behooves you to choose an antenna which has considerably more power handling capability than you plan to use. However, there is a caveat. Far too many antenna manufacturers over-rate the power handling of their antennas. As pointed out in the Amplifier article, some antenna types should be avoided. For example: Any vinyl covered one especially those with large metal end caps; Any screwdriver antenna with more than 10 turns per inch, or smaller than 2 inches in diameter, or wound with less than size 14 awg wire. This includes stubby screwdrivers (except the 680S Scorpion), any Hamstick®, any Hustler®, the Opek®, and any antenna where the loading coil is mounted higher than 60% of its length. One of the reasons ground plane-less verticals (no radials, perhaps just a pipe or ground rod) do not perform well, is because the current returned to the source is forced to travel though lossy ground. A similar situation exists in a mobile installation. That is to say, some of the antenna current returning to the source flows through the surface under the vehicle, rather than through the vehicle itself. This fact increases ground losses which are already high. One of the base-station work-a-rounds, is to elevate the antenna away from the poor conducting ground surface, and use an artificial ground plane; elevated radials in other words. However, we don't have that luxury in a mobile installation. There is one thing we can do, and that's raise the antenna as high as possible on the vehicle (but not atop a long post! ), consistent with local height restrictions (legal, trees, wires, etc.). Doing so reduces the coupling between the antenna and the surface under the vehicle, which increases the current flow through the body of the vehicle, and reduces the overall ground losses. It should be noted that a proper mobile installation will always have more ground loss than a proper base station installation, even using the exact antenna! It should also be noted that you can't measure the ground loss directly, although they are represented as part of the input impedance of the antenna in question. Therefore, changes in the input impedance cannot be assumed to be a reduction or increase in ground losses, without a thorough understanding of the other parameters involved. Field strength measurements will give you a better comparison of the changes, but here too they have to be carried out in a scientific (all factors normalized) manner, or the results will be just as ambiguous as any input impedance measurement. The effect can be shown graphically by using antenna modeling software like EZNEC. However, modeling programs do not calculate ground losses accurately, even in ideal situations. When they're used to model vehicle installations, ground loss calculations are even less exact, due in part to the complexity of accurately modeling a vehicle's superstructure. Thus, the often-quoted data relating to mobile HF antenna models is often contrary to empirical testing. Incidentally, the number of modeling segments in EZNEC required to duplicate an average vehicle's real-world condition, exceeds 200. A fact which requires the full-boat, commercial version, not the free, down-loadable version. Even then, the accuracy can be poor if the ground loss figures are incorrect. There's another important item with respect to ground losses which needs addressing, and that is consistency in ground conductivity. While the mean deviation over a large statistical area may be fairly narrow, over a small statistical area the mean deviation can be rather drastic. Adding insult, mobiles operate on paved surfaces for the most part, and road surfaces are even more inconsistent than soil surfaces. The mean deviation in soil conductivity changes as the moisture content, and surface temperature of the ground changes. In fact, the changes are often great enough, that you can measure the difference in input impedance between morning, and evening. This fact is yet another reason antenna shootouts are not nearly as definitive as organizers would lead you to believe. Here's one more important point to ponder. Most amateurs wouldn't think about installing a base-station dipole antenna with the elements parallel to one another (spaced 6 to 8 inches apart), with the feed point a few inches off the ground. Yet, that is essentially what they're doing when they mount an HF mobile antenna on the back of a van or SUV utilizing a trailer hitch type mount. The fact you can make contacts with such a setup doesn't mean much. Amateurs often try to check the directivity of mobile antennas, especially HF ones, by driving the vehicle is circles, and having some distant station read out the change in S meter readings. This type of testing is fraught with problems. Instantaneous changes in propagation, localized changes in surface conductivity, poor S meter performance, and the subjectivity of the listening station make such measurements baseless! Oh, by the way, this premise cannot be ignored even if you use a turntable under the vehicle! There are a few misguided souls who believe the body of a vehicle increases the electrical length of an HF antenna attached to it, but only if the antenna is mounted atop the vehicle! The main hypothesis seems to be that the body is a vertical structure, and akin to the lower half of a vertical dipole. This is not the case in a mobile installation, nor is it the case for a near-ground mounted vertical dipole due to mutual coupling to the ground surface below. The body of a vehicle is an inadequate ground plane for any frequency under about 200 MHz. Thus it couples to the surface under it much like two plates of a capacitor. Since there is some resistive loss (in series with the input impedance of the antenna), a portion of the return current is radiated by the body. This radiation has little effect on far-field signal strength, but may contribute to some near-field signal strength depending on the frequency, and distance involved. This is yet another reason why field strength measurements have to be done in such a way to avoid any near-field radiation. Radiation resistance (Rr) of a vertical antenna is a function of the electrical length, and the current distribution along that electrical length. Series and parallel losses (ground losses and stray coupling losses respectively) are always present, with series losses the most severe. Lowering of ground (series) losses, and raising radiation resistance will result in higher efficiency, but the latter is easier to accomplish by correct use of a cap hat. However, this fact should not be construed to mean, that mounting an antenna on the top of a vehicle will increase its electrical length. It will not! It will decrease ground losses to some degree which may be of some benefit, especially if the radiator (antenna) is significantly shorter than 1/10 wave. Incidentally, there is almost nothing you can add to the body of a vehicle to decrease ground loss. This includes adding a second antenna, however configured, as a radial or supposed counterpoise! Unfortunately, most antenna field strength measurements are taken with the receiving antenna very close to the surface. There are questions about how effective a low measuring point is, because receiving heights close to ground level are highly effected by nearby objects, including the people doing the measuring. More about this subject is in the Shootouts article. The angle of radiation from a horizontal antenna, is rather dependent on the ground conductivity under the antenna. This fact is why height above true ground is so important to horizontal antennas. However, when it comes to verticals, height isn't so important, as long as the ground losses are low. There are a couple of ways to accomplish this with a base-station vertical. One is to lay out a bunch of radials (at least 25 or so) under the antenna, or raise the antenna off the ground, and use a lessor number of elevated radials. Rather than insert a book-length dissertation at this point to explain why this is so, I suggest you read Rudy Severns', N6LF, series of white papers on the subject. If you want the short course, read his PowerPoint® presentation. To quote Rudy Severns, Any practical ground system will not affect the radiation angle or far-field pattern! Rudy goes on to say, The ground system around the antenna does nothing for the far-field pattern except to increase the power radiated for a given input power. What Rudy is saying is, a vertical without any radials will have virtually the same angle and pattern as one mounted over a perfect ground plane, albeit at a much reduced level. We can see this easily by looking at the chart on the left. If there is any change in the angle of radiation, it is due to the presence of common mode currents, and factors not directly associated with ground loss! We can reduce the ground losses in a mobile installation by increasing the mounting height of the antenna. Two things happen when you do. First, the resonant frequency decreases, due in part to a reduction in the capacitive coupling between the antenna, and the surface under the vehicle. The ground losses decrease, as does the input impedance, basically for the same reason. The reduction in ground losses effectively increases the antenna's efficiency—a worthy endeavor! Incidentally, this is why good installations require antenna matching networks (antenna input impedance less than feed line impedance), and poor ones typically do not. The another common myth is the level of distortion in the radiation pattern caused by the body of the vehicle. Yes, the pattern is distorted, but not nearly to the level most folks believe. Regardless of the aforementioned shortcomings of modeling software, they're fairly accurate in modeling the radiation pattern. In fact, they fairly mimic empirical testing. That is, if folks are willing to go through the necessary 200+ machinations to describe the vehicle's superstructure to assure even a modicum of accuracy. If you do the tedium, you'll discover the differences are seldom more than about 3 dB. However, the difference may be somewhat greater when modeling antennas mounted low on the back of vans and SUVs. I might add, if the modeled (or real world) measurements exceeds ≈6 dB, then a higher, less lossy mounting location and/or style is in order. There is a related myth which needs to be dispelled. That is, that ground conductivity in areas near the ocean account for increased propagation and signal strength, and even lower angles of radiation. The truth is, the affect is largely a result of a clear horizon unencumbered by structures, and flora, albeit with a slight decrease in near field ground losses. Again, localized ground losses have no measurable affect on the radiation angle or (the) far-field pattern! As mentioned above, when an antenna is mounted low to the surface the vehicle rests on (trailer hitch mount for example), a goodly amount of the return current is forced to flow through the lossy surface under the vehicle. If we mount the antenna higher on the vehicle, and place as much metal mass (directly) under it as we can, more of the return current flows in the body of the vehicle. This reduces, but does not eliminate ground losses. Higher mounting typically results in a 3 dB to 5 dB increase in field strength; an obvious worthy goal. There are at least 10 web sites dedicated to NVIS. The misinformation on all of these sites, is roughly based on the same set of now declassified, but flawed data (circa 1944), from the U.S. Signal Corps. It has since been retracted. However, once something gets on the Internet, it accepted as gospel. In any case, the myth can be easily dispelled by modeling (as described above with at least 200 segments) a vertical antenna with, and without, a bent-over whip. Be careful, however, as there will be changes in the input impedance, and resonant frequency. Proponents misconstrue these changes as support for the myth. Or, they site S meter readings, which are suspect at best. What's more (in difference to on-line resources), NVIS is very difficult to accomplish at frequencies higher than about 5 MHz, and impossible over 8 MHz. Yet, at least two antenna manufacturers openly state their antenna's NVIS capability up to, and including 30 MHz. Perhaps the only bigger myth, is the SWR myth! There are several inexpensive ways to measure an antenna's input impedance with a fair degree of accuracy, typically ±5%. The MFJ-259B is one. If you have, and know how to use, antenna modeling software like EZNEC, you can get fairly close to an antenna's real-world efficiency by comparing the measured parameters against calculated ones. If you have the acreage, the right kind of test equipment, a fair knowledge of antenna theory, some cash liquidity, and a whole lot of time on your hands, you can even measure the signal strength at any given angle of radiation within a few percentage points. Alas, most amateurs don't have these facilities, so they resort to the SWR myth. Measuring the SWR is an easy task, so I suspect this is why neophytes often use SWR as a means of quantifying and qualifying their antennas. 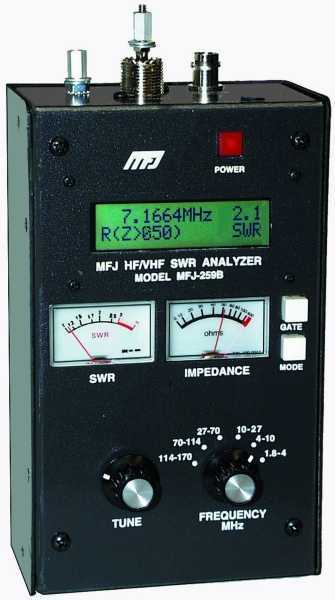 The truth is, a low SWR means nothing other than your transceiver will be happy! Maybe! One thing is for sure, it will not give you the true resonant point, unless the antenna's input impedance (at resonance) is exactly R50 +jØ; a very rare occurrence indeed! Fact is, it is possible to damage some transceivers even though the SWR appears to be low. A very common belief is that the lowest VSWR point is always the exact resonant point. This is a myth! For example, an unmatched, HF mobile antenna, of decent quality, will have an average input impedance of ≈25 ohms at resonance. This represents an VSWR of 2:1. This fact can be easily demonstrated by measuring the input impedance with an antenna analyzer. By definition, an antenna's resonant point will be when the reactive component (j) is equal to zero (X=Ø, or +jØ). At that point in our example shown at left, the R value reads 23 ohms, and the SWR readout will be 2.1:1 (actually 2.17:1). If we raise the analyzer's frequency slightly, the reactive component will increase (inductively) along with an increase in the resistive component, hence the VSWR will decrease, perhaps to 1.4:1. In this case, the MFJ-259B is connected to an unmatched, screwdriver antenna mounted on the left quarter panel, and measured through a 12 inch long piece of coax. This fact is shown graphically in the image at right. Depending on the transceiver in question, the resulting reactance may or may not cause any major problems, but it is still advisable to properly match your antenna. It should be noted, however, if your antenna doesn't require matching (input impedance ≈50 ohms), you need a better antenna and/or mounting scheme! Looking at this another way. You measure your antenna's SWR with an SWR bridge, and it's 2:1. 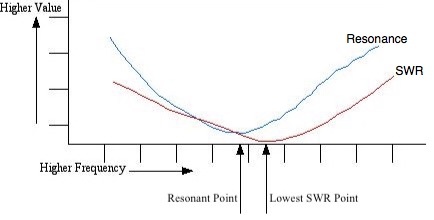 If there is no reactance present, then the input impedance of the measured antenna could be 25Ω (typical for a short HF mobile antenna), or it could be 100Ω. It could also be 50Ω ±35j. The only way you would know if there was reactance present, would be to use an antenna analyzer instead of the SWR bridge. Because of this issue, the SWR readout of any antenna analyzer should be ignored while attempting to match a mobile antenna! If the input impedance of an antenna is other than 50 ohms non reactive (50R +Øj), any length of coax inserted between the antenna, and the antenna analyzer (or VSWR bridge), will skew the readout results. The amount of skew depends on the magnitude of the mismatch, and the length of the coax in question. For this reason, antenna analyzer measurements should be taken as close to the antenna as possible. Coaxial myth one: The coax feed line must be a specific length. 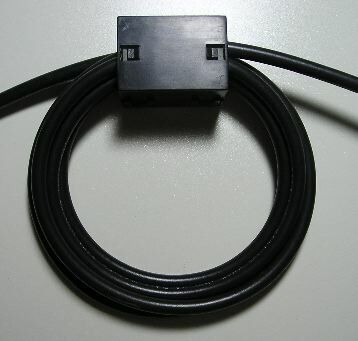 Several antenna manufacturers suggest using a specific length coax cable between the transceiver, and the antenna, or they suggest using an open stub cut to some length. Both of these schemes are SWR patches, not fixes. Shunt matching is the only correct way to match a remotely tuned HF mobile antenna to 50 ohms. If you read the article, you'll know why. Coaxial myth two: Using the best grade of coax money can buy, will be worth the expense. Not! There are two aspects of this myth. First, the the length of coax used in the average mobile installation, seldom exceeds 10 feet. Thus the difference between say RG213, and RG8X, is less than .25 dB! Ah, but there is a hidden facet as well! As mentioned above, it is very important to properly choke off common mode currents from coaxial feed lines, especially mobile ones. In order to duplicate the common mode choke shown at right (7 turns, 3/4 inch ID, mix 31 split bead, ≈2.2 kΩ @ 10Mhz) on RG213, would require 49 similar split beads. That's about $250 worth, instead of just $5! By the way, serial bead chokes tend to be mostly inductive, rather than mostly resistive over their bandwidths, which reduces their common mode effectiveness. Coaxial myth three: A low SWR in mandatory! The truth is, any SWR under 1.6:1 is A-OK. In fact, flattening the SWR down to 1:1 will make an insignificant change in ERP. And typically, common methods used to further decrease the SWR will result in more overall losses, not less! This includes using built in or external antenna tuners. The justification for this inanity, is the fact that SWR changes as we drive. But the truth is, no antenna tuner tunes fast enough to match these nearly instantaneous changes in ground loss. In a general sense, with respect to HF mobile operation, wider bandwidth usually relates to lower efficiency, but not always as some believe. For example, if we use a shorted stub to impedance match an HF mobile monoband antenna, the 2:1 bandwidth edges will expand, perhaps by double. This is due to the frequency versus reactance curves of the stub, and the antenna being opposite of one another. However, like capacitive matching, stub matching is monoband in nature. Worse, one manufacturer taunts the bandwidth of their high-powered coils as a selling point. The truth is, the large end caps reduce the Q of the coils below that of their standard sized ones. The point here is, be careful of advertising claims about bandwidth. This always raises a question about what the 2:1 or 3:1 bandwidth should be. Well, here's the truth. Two, otherwise identical installations, will have different bandwidths. Why this is so, lies in what comprises an (relatively speaking) efficient HF mobile antenna. There is a formula circulating the Internet which states that antenna Q is equal to 360 times the frequency in MHz, divided by the 2:1 VSWR bandwidth in kHz. One has to assume they mean antenna system Q, but that's not a given. The truth is, the actual Q of the antenna (system or otherwise) requires a textbook-full of formulas, and a lot more information than just the 2:1 bandwidth! Using a properly-mounted cap hat will always increase both bandwidth and efficiency, and in some cases, drastically! An improperly-mounted one will also increase bandwidth, but efficiency will suffer just as drastically! These facts are why it is so important to properly design, and install cap hats. If you read the article, you'll know why some impressive designs are such lousy performers. And, considering the ever-increasing popularity of remotely-tuned HF mobile antennas, the bandwidth, 2:1 or otherwise, becomes all but moot. Justifying one's no-hole installation by using trite references to leases, wives, and depreciation value, is inane. Yes, sooner or later, drilled holes might have to be repaired depending on a lot of unknown factors (vehicle mileage and/or condition for example). However, a no-hole installation can be just as costly, perhaps more so. The damage to the trunk lid should in the left photo is obvious, but the damage to the quarter panel is less so. Repairing this type of damage isn't going to be inexpensive, especially if the trunk lid has to be replaced. But this isn't the only damage which can occur. The antenna in question is a Yaesu ATAS120. From the get go, it is not a sturdy antenna in any respect. Each time the trunk lid is opened and closed, stress is placed not only on the mount, but on the antenna as well. What's more, trunk lip mounts allow the antenna to sway back and forth, further exacerbating the body damage, and the mechanical stress place on the antenna. Another popular way to avoid drilling a hole is to use a mag mount. However, there are a couple of hidden problems with them. First, there is no RF ground connection. As a result, the coax cable radiates a large percentage of the radiated power (via common mode currents flow), and its pattern includes the interior of the vehicle it is mounted on! The other is the fact they collect road debris, typically metallic particles from brake shoes. Add in a little acid rain, and they leave circular patterns in the paint often referred to as mooning. Regular cleaning doesn't help either, and after a few months use, the moons standout like a sore thumb. Here is something else to consider. Rather than base your no-holes installation on trite references, base it on sound engineering practices, with a mind set towards what if... And that what if should include safe operation, ease of requisite repair, and associated long-term costs.